In India, I grew up as a student of botany. We learned plants. Their names, their flowers, how they look, how they work. Our professors helped us to learn the anatomy, physiology, genetics and evolution of plants. Even after being out of botany for many years, I still remember a lot of the Latin names. I still remember names of the plants families, and genus and species. 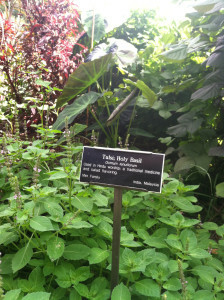 At the Brooklyn Botanical Garden, some names quickly came back, with help from the signs they posted next to the plants. I’m going to talk about just a few, and their importance to us. You can explore more. There are so may of them that we can learn — with their special values for mankind. Every Hindu family wants to keep a Tulsi plant in their house. It’s sacred that way. 1. 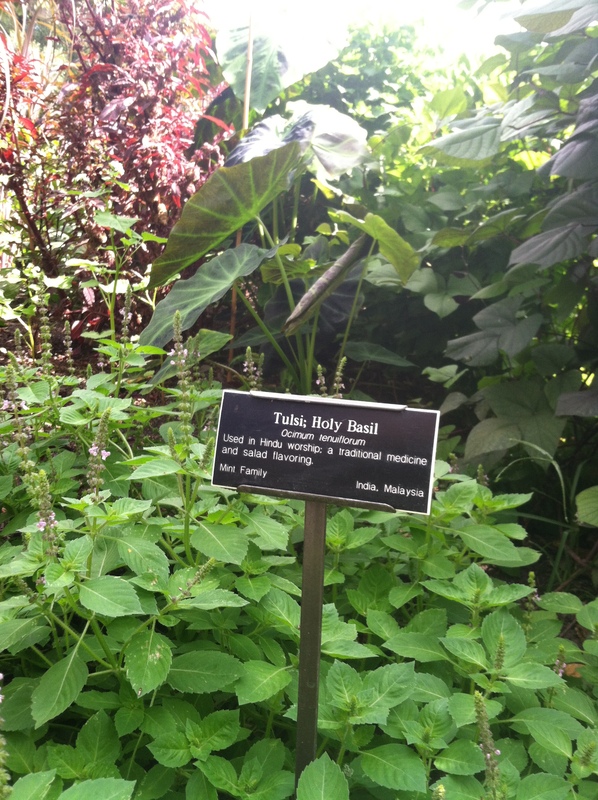 Tulsi — of the genus Ocimum. — Beautifully aromatic plant. Mint-type smell, but not quite strong. It has a pleasant flavor to it. You touch it, and savor the flavor. Most importantly, it’s a plant that every Hindu family (or even Muslim families) want to keep in their household, somewhere. On the little ID sign at the garden, it said it’s also used for salads. But honestly, I have never seen anyone using Tulsi for food. At least the Ocimum sanctum we knew back in India: nobody would use a sacred plant such as Tulsi for food. When we were little children, we would take a small leaf or two off, and chew, and be merry. Or, crush the small flowers (inflorescence) between our fingers and smell the fingers for the next few hours. 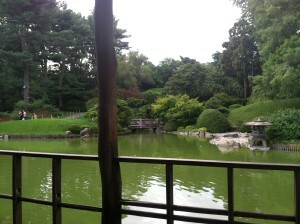 It was such a beautiful experience to find the plant at the botanical garden. I do know for the fact that it has some medicinal properties — especially for coughs and colds in the rainy season or the winter: people make an elixir out of the leaves, and drink it early in the morning. Some even mix it up with a spoon of honey. It works so well to soothe a sore throat too. 2. 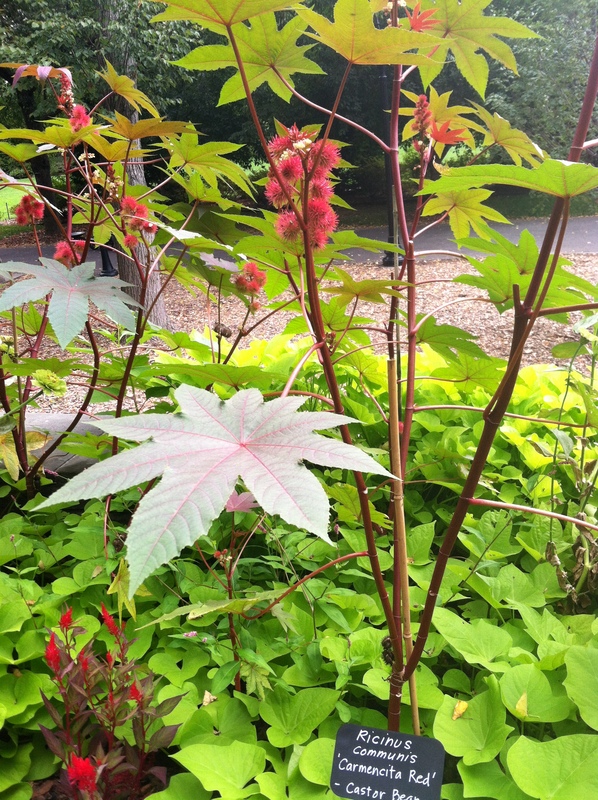 Redi — Ricinus communis. — I remember we went out to botanical excursions together with our friends and teachers, and collect plants out of the countryside. This was a plant we found everywhere especially by the commuter rail roads. They were abundant. Our teachers first told us that their seeds when ripe, are harvested and pressed to make the castor oil, a cure for constipation. But castor oil, according to some of my American friends, is also used as antiviral, antibacterial, and antifungal agents, or that it has been used topically to treat a variety of skin conditions, reduce pain, and stimulate your immune system. Castor oil is a triglyceride, comprised of fatty acids, and that is something some people are a little cautious about. But using a small amount of it would not cause such a major harm, would it, especially when the healing properties are so high? I’ll write more. It was a very happy experience. Enjoy the garden. 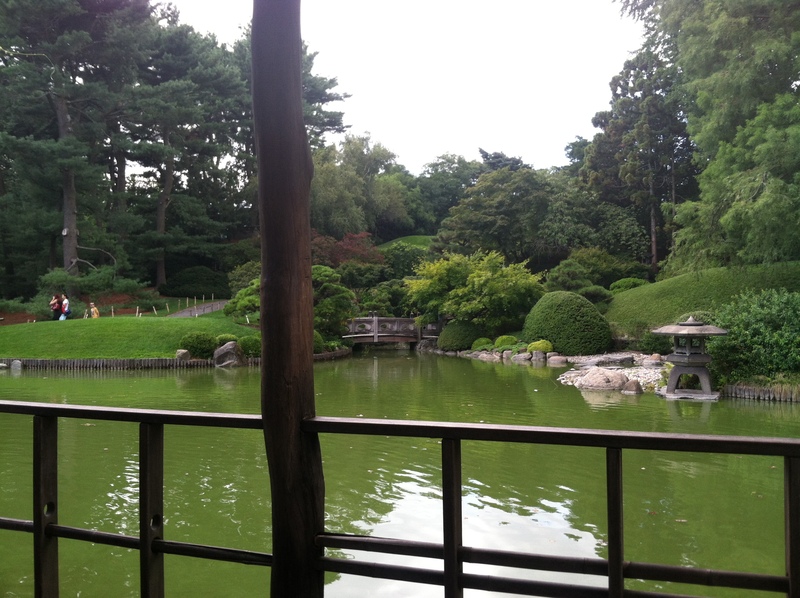 It’s so beautiful, and so peaceful! The Castor Oil Plant. I was so happy to see it here in Brooklyn!